In days of old, before hand mixers, the true sponge cake was produced by using the whisking method. 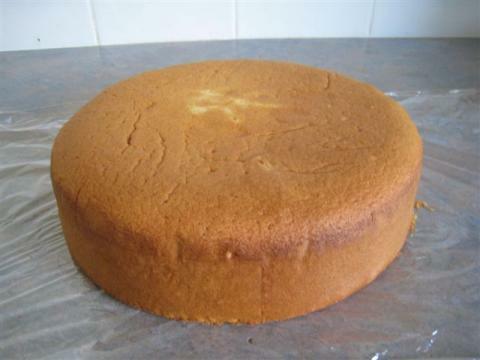 The "true" sponge cake contains no or very little fat (margarine, lard, butter or oil). The first step is to whisk together the eggs and the caster sugar, until they increase greatly in volume and the mixture is thick and creamy in texture. The lightness of the finished cake largely depends on this process, which may take as long as 20 minutes if you are whisking by hand. The process can be quickened if the bowl containing the eggs and sugar is placed over a pan of hot water - and even more speedy if you opt for an electric beater. I'm going to assume that in this day and age, you're using an electric beater, but attempting the cake by hand will definitely make you appreciate new-age technology, and a greater understanding of the magnificent feat that was achieved by women in the "olden days" when they produced the perfect sponge cake. This whisking must be continued until the mixture is sufficiently thick to retain the impression of the whisk for a few seconds. As soon as this stage is reached, remove the bowl from the pan of hot water (if you used it). If you opted for the electric mixer, discontinue using it for the next stage which should be carried out by hand, to allow the mixture to retain the "air", which is essential for a beautiful light fluffy sponge result. The sifted flour must now be lightly and carefully folded into the egg mixture. If the recipe needs water, it is added at this stage. It is important to agitate the mixture as little as possible; otherwise the air bubbles which have been incorproated may be broken down and lost, and the final texture of the cake will be quite dense. As soon as all of the flour has been blended in, pour the sponge mixture into the cake tin. It should resemble a thick batter. The tin should be prepared by greasing and dusting out with mixed flour and sugar, or flour alone. In teh case of larger cakes, it is a wise precaution to put a round of greased paper or baking paper in the bottom of each tin. As with all cake making, great care should be taken when baking sponges to avoid any sudden inrush of cold air into the oven, as this may possible cause the cake to sink. I still remember my mother telling me to walk on tip-toes around the house when she was baking cakes - claiming that the stomping would cause her cakes to sink.